They say a picture is worth a thousand words, and in this case I believe the old saying is extremely relevant. This is a picture of my malpractice insurance bill, which totals $261 for the year. I imagine you pay more for your car insurance! Chiropractic is extremely safe and this document is a great piece of evidence to support this claim, allow me to explain why. The job of the insurance company is to assign risk and value to each profession or activity. For example, if you are a young man between the ages of 16-25 you are going to pay extremely high rates for auto insurance. The reason is simple: the insurance company has a plethora of data to support the fact that you are a high risk if you fall into that category. After years and years of analyzing data, they have come to the conclusion that the risk for drivers in this category is higher than others. 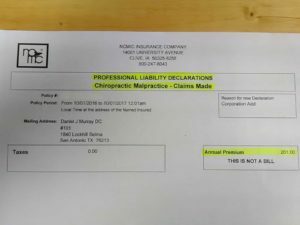 You can rest assured that insurance companies have done the math on Chiropractic also, and judging by the bill you can see that insurance companies consider us to be very safe. I try not to compare myself to medical doctors, but I would challenge any MD to provide proof that they are considered a lower risk by an insurance company! We are taught to trust medical doctors, we are taught that medicine is safe and good for us, but statistics don’t lie. Again, I would encourage you to think logically and without biased when you ask yourself the following question: why would an insurance company charge a medical doctor more for malpractice insurance when compared to a Chiropractor? If Chiropractic is safe and effective, why do medical doctors sometimes frown upon the profession? In the 1940s the American Medical Association (AMA) approached the DC’s (doctors of Chiropractic) and DO’s (doctors of osteopathy) and offered for both groups to join the medical profession. The DO’s agreed and are now part of the medical world. The DC’s did not accept the invitation and the AMA retaliated by forming the “Committee on Quackery”. The Committee on Quackery spent the next 30 years creating anti-chiropractic propaganda that was taught in every medical school in the nation. Thus we have an entire generation of MD’s who were led to believe that Chiropractic is unsafe and unscientific. Even though this has been proven incorrect over and over again, some medical doctors refuse to change their view on Chiropractic. Let’s talk for a bit more about why Chiropractic is so safe. Chiropractic seeks out misaligned vertebrae that are not moving properly. The Chiropractor then makes an adjustment to restore normal motion. Again, we are working within the normal range of motion for the joint, so injury is extremely unlikely.